The “Ministerial to Promote a Future of Peace and Security in the Middle East,” held jointly by the United States and Poland, will take place in Warsaw, Poland on February 13-14. We have received very positive responses from our partners and allies around the world, with dozens of countries expressing their willingness and intention to participate in this constructive dialogue. Countering extremism and illicit finance. Countries will come together to prioritize these regional challenges, share information, and discuss how we can cooperate more effectively to address them. There will be a press briefing held at the conclusion of the Ministerial to summarize the event’s discussions as well as present a joint statement by the Ministerial co-chairs – the United States and Poland. Notice that the Palestinian issue is not mentioned at all. 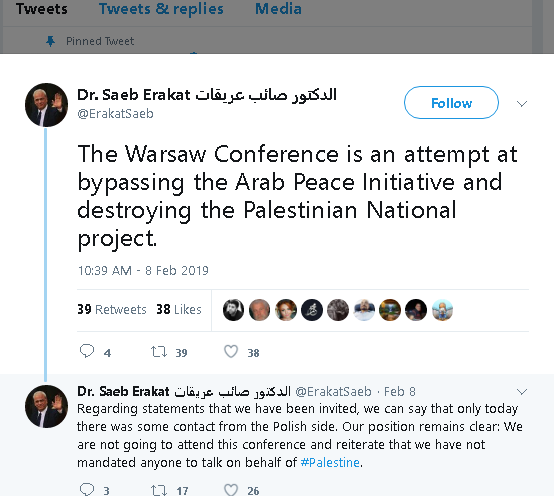 The Palestinian Authority was invited, but their response was pretty much that unless the Palestinian issue is the central focus of any conference on the Middle East, they want nothing to do with it. In the past two weeks, several PA officials have called on the Arab countries to boycott the upcoming conference and to remain committed to the 2002 Arab Peace Initiative, which calls for normalizing ties between Israel and the Arab countries only after a full Israeli withdrawal to the pre-1967 lines. The PA Ministry of Foreign Affairs accused the US of “declaring war on the just Palestinian cause” and international resolutions. It claimed that the US was convening the conference in Warsaw as part of its effort to impose a new world order. The ministry warned all countries against participating in the conference, saying it was also part of an American-Israeli “conspiracy” to eliminate the Palestinian issue. This conference will be a test of waning Palestinian political power. If Arab governments ignore the PLO's demands to boycott the conference, it shows that there is no longer any fear on their part to appear to be turning their backs on Palestinian demands. The list of attendees will be very interesting indeed.